What are Global Assist's features? Download your professional & personalised App onto their tablet or phone. 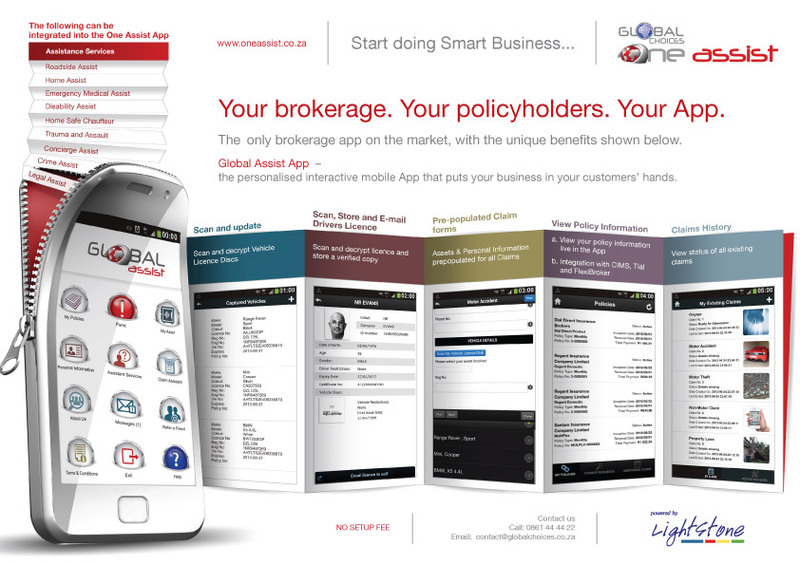 Access important information about your brokerage and your offerings. Communicate directly with you live from the App, and vice versa. Request additional cover and uninsured risk inclusions. Lodge full claim forms on the App including: photos, GPS maps, voice recordings, drawings, on-screen digital signatures. Access customised assistance services promoting dependency and client loyalty retention. Update personal, family and dependant details, including emergency medical information etc. Find the nearest services: Police stations, hospitals, taxi, plumber, electrician etc. Recommend and refer friends and leads to your brokerage. Promote your social media presence on Facebook, Twitter & LinkedIn. By providing your policyholders and clients with a personalised tool that really makes a difference to their everyday lives, your business becomes more than just a service supplier, it becomes a wingman, a trusted advisor, a reliable partner when needed most - promoting loyalty, client retention and brand awareness.